A French museum has re-opened with added security measures following a weekend protest and attack on the controversial artwork Immersion (Piss Christ). Avignon's Lambert Collection Museum of Contemporary Art re-opened its doors on Tuesday for the first time since a vandal attacked Andres Serrano's controversial work. Museum Officials decided to leave "Immersion" and "The Church" another Serrano work marred by Sunday's act of vandalism on display so the public can view the damage. The museum has greatly strengthened its security measures however and has included plain clothed detectives in and around the museum. The photograph was damaged using a screwdriver or ice pick on April 17, 2011, According to witnesses, museum staff stopped a pair who tried to smuggle a can of spray paint and a Chisel into the museum late Sunday morning. 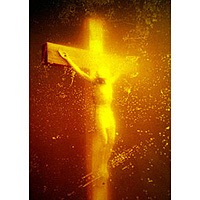 Piss Christ is a 1987 photograph by artist and photographer Andres Serrano. The photograph is of a small plastic crucifix submerged in a glass of what appears to be a yellow liquid. The artist has described the substance as being his own urine. It was one of a series of photographs that Serrano had made that involved classical statuettes submerged in various fluids—milk, blood, and urine. Andres Serrano has said that "This work is not intended to denounce religion; it alludes to a perceived commercializing or cheapening of Christian icons in contemporary culture". The piece has been controversial since it was first exhibited in 1989, with detractors, including United States Senators Al D'Amato and Jesse Helms; outraged that Serrano received $15,000 for the work. Serrano received death threats and hate mail, and lost grants due to the controversy. 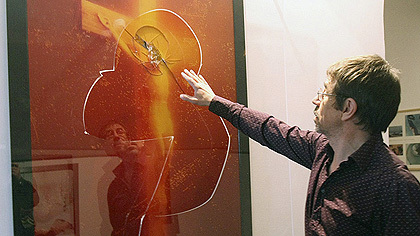 Supporters argued that the controversy over Piss Christ is an issue of artistic freedom and freedom of speech. At the National Gallery of Victoria in 1997, the then Catholic Archbishop of Melbourne, George Pell, sought an injunction from the Supreme Court of Victoria to restrain the National Gallery of Victoria from publicly displaying Piss Christ. When this was not granted one patron attempted to remove the work from the gallery wall, and two teenagers later attacked it with a hammer. Sister Wendy Beckett, an art critic and Catholic nun, stated in a television interview that she regarded the work as not blasphemous but a statement on "what we have done to Christ": that is, the way contemporary society has come to regard Christ and the values he represents. The Lambert exhibit featuring Immersion has been on display since December and continues on until May. Earlier this month, the Catholic bishop of Avignon singled out Serrano's contentious 1976 artwork and called for its removal from the gallery. On Saturday, hundreds of people gathered outside the museum to protest the work. French Culture Minister Frédéric Mitterrand has said he recognized that the image was shocking to some people, but he also condemned the vandalism as "an attack on a basic principle: the exhibition of these works being fully in line with the freedom of creation and expression enshrined in law." Calling himself a "Christian artist," Serrano told France's Libération newspaper this week he was "Shocked by the reaction to his work".